A few weeks ago on a Saturday or a Sunday, I suddenly had the urge for fish. Fish is not something I cook regularly, although I don't know why that is, since I actually like many fish dishes quite a bit. I gave in to my craving, and bought a few boneless halibut fillets, and threw together a simple dinner. 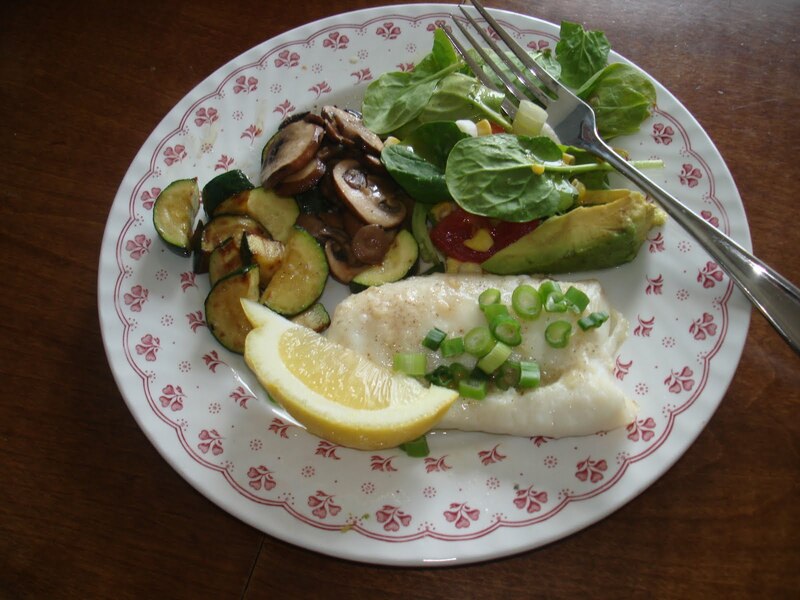 If preparing this entire meal, prepare the vegetables first and get them in the oven about 5 minutes before the fish. 1- Line a cookie sheet with aluminum foil or grease cookie sheet. 2- In a small cup, mix together butter, garlic, a few shakes of salt and pepper. 3- Place fish on baking sheet, and using a pastry brush, brush the tops of fish with garlic butter. 4- Place in oven and cook until white all the way through, approx. 15-18 min. 5- Remove from oven and sprinkle with chopped green onions or chives when serving. 1- Cover a cookie sheet with aluminum foil, or grease sheet. 2- In a bowl, place olive oil, herbs, salt and pepper and give it a stir to mix. 3- Drop in mushrooms and zucchini and mix until coated. Add some additional olive oil if necessary. 4- Place vegetables on baking sheet in a single layer. 5- Cook until cooked through, approximately 20 minutes. Place a layer of baby spinach on a plate. Place sliced tomato and avocado on top. Sprinkle corn kernels over salad and top with a lime/mustard vinaigrette. Mix well and taste. Adjust seasonings accordingly. I like my dressings strong. If you prefer a lighter taste, thin with some additional oil, or some water. Add a pinch of sugar or some honey for a sweeter flavour. A great early summer dinner. Enjoy with a glass of white wine!